This euro swirl hanging basket comes with attached saucers. 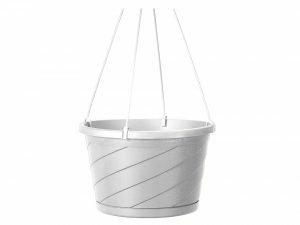 Renowned for its stylish swirl design, the euro swirl hanging basket is a beautiful accent to the home, patio and garden. Large hooks snap onto basket easily for secure hanging. Hangers clip onto rim for clean merchandising. No inside saucer required. Available in white color. It measures 12-inch diameter. - Euro swirl hanging basket. - Large hooks snap onto basket easily for secure hanging. - Hangers clip onto rim for clean merchandising; no inside saucer required.